Now that the Barack and Michelle Obama's official portraits have been unveiled, they hang in the Smithsonian's National Portrait Gallery in Washington, D.C. for all to enjoy. 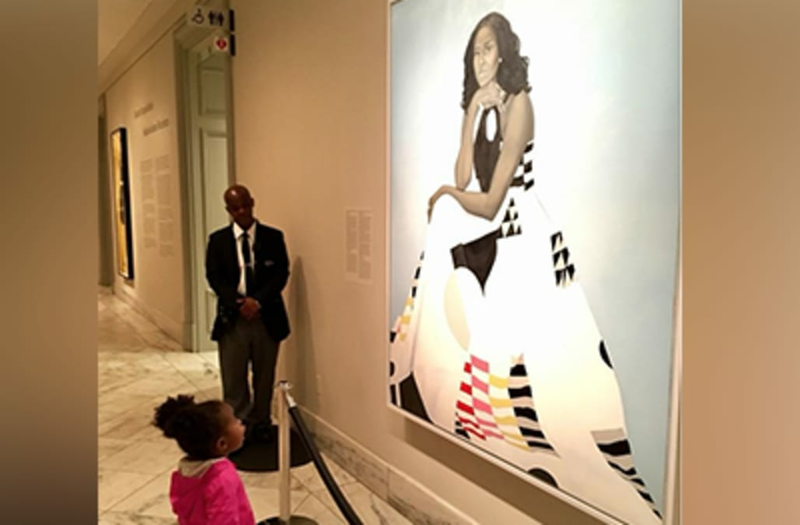 On Thursday, Facebook user Ben Hines shared a stunning photograph he took of a young black girl staring up at Michelle Obama's official portrait with her mouth open in awe. "Donna Hines and I made a pilgrimage today and we were delighted to wait in line behind this fellow art lover and hopeful patriot," he captioned the powerful image. Since Hines first shared the image it's gained thousands of likes on Facebook and is being widely shared on Twitter, capturing the hearts of people across the world. Michelle Obama first unveiled the portrait, created by Baltimore-based artist Amy Sherald in February. At the time, Michelle said, "I'm thinking about all the young people, particularly girls and girls of color who in years ahead will come to this place and they will look up and they will see an image of someone who looks like them hanging on the wall of this great American institute." Hines' photo captures the former first lady's thought so perfectly it's remarkable. "When I look at this picture I think back to my first field trip in elementary school to a museum. I had only seen paintings in encyclopedias up to that point in my life. There was a show up of work by painter @thebobartlett whose work still inspires me to this day," Sherald wrote. "There was a painting of a black man standing in front of a house. I don't remember a lot about my childhood, but I do have a few emotional memories etched into my mind forever and seeing that painting of a man that looked like he could be my father stopped me dead in my tracks," she continued. "This was my first time seeing real paintings that weren't in a book and also weren't painted in another century. I didn't realize that none of them had me in them until I saw that painting of Bo's. I knew I wanted to be an artist already, but seeing that painting made me realize that I could. What dreams may come?" Many echoed Sherald's statements, sharing the photographs and marveling at how beautiful and powerful it was to witness a young black girl seeing this high level of representation.